Chipper Jones sits at his locker, shoulders slumped, deep creases under his eyes, looking up wistfully. He’s wearing a Braves T-shirt, compression shorts, knee socks, and slip-ons. At that moment, he doesn’t look like one of the greatest hitters who ever lived. In a state of half-dress, still in good shape but with a weathered face that betrays his age, he looks like the best player on a 35-and-older fast-pitch softball team. He’s talking about baseball mortality. Rivera’s, sure. But mostly his own. Chipper turned 40 on April 24 and his own knees are failing him, and it’s eating him up inside. Two years ago, Chipper blew out his left ACL. Now, his knees punish him. They prompted surgery in spring training. Made him miss the first four games of the season. They blow up on plane rides. After two or three games in a row, they give him agony, to the point where some mornings he can barely walk. This is the burden he bears as the first-place Braves battle to win their first NL East crown in seven years — after winning 14 of 15, with Chipper playing a significant role in 11 of them. The Braves have gotten good power out of Chipper’s third-base caddy, Juan Francisco. Several other hitters have also stepped up, propelling Atlanta to the second-highest-scoring offense in the National League. Still, he wants to be out there. Longs to be out there. Chipper shoves his cup on. He’s talking about Albert Pujols’s season-long slump, and the worst slump he ever had. Funny thing for a player of his stature to say. But Chipper can be at once confident and self-deprecating. He describes what his presence in the lineup means for the confidence of his teammates. In the next breath, he laughs at the notion of being in Pujols’s company. Chipper stands up, pulls on his uniform pants. When is it time for a player to quit? he’s asked. It’s a thorny question, one that might piss off other players, even end an interview. Chipper doesn’t dodge the question. He’s thought about it a lot lately. Chipper sits back down, ties his shoes. A few lockers over, one of those young, energetic teammates is getting ready to take the field. When Jason Heyward first came up two years ago, you’d hear stories of Chipper taking the rookie under his wing, conveying advice to a supernaturally talented player who wouldn’t be able to legally drink for four more months. These are traits that would prove invaluable for a manager, but Chipper has no such plans after his playing career’s done. Still, former teammate and current Braves first-base coach Terry Pendleton sees a future coach, at least. Chipper pulls on his jersey. As much as sitting out games hurt, his pride takes a bigger hit when he fails in situations where he might have once succeeded. Once a good baserunner and a 15-25 steals guy, he now looks slow in his trademark weird gait, running with his shoulders slightly twisted, one edging ahead of the other. When he struggles at bat he gets even madder. “I refuse to believe I can’t catch up to a heater,” he says. “It’s just the mind-set of a guy who’s hit in the middle of the lineup for 18, 19 years. You gotta hit the fastball to hit in the lineup, and make adjustments on other pitches. But there are times when fundamentally you’re not there and the fastball’s getting by you where you just say, ‘OK, I’ve just got to fight off the fastball and whenever he throws me an off-speed pitch for a strike, don’t miss it. '” That happens a lot more now than it did a decade ago, he admits. Chipper fiddles with his buttons. He tells stories about setting up pitchers, about the time he was facing vintage Pedro Martinez when Pedro was with Montreal, took a terrible swing on a changeup early in the game to give him more confidence in his change (as if he needed it), then sat dead changeup on a 3-2 count later on, got one, and launched a grand slam. The conversation turns to this year’s actual results. He can sandbag all he likes, but Chipper’s hitting .311/.358/.554, leading the team in slugging and Weighted On Base Average and ranking near the top in several power categories. Later that weekend, he’ll get nearly as fired up after Rockies starter Jamie Moyer accuses him of relaying signs from second base. He claims he’s never stolen or relayed signs in his life. Maybe he has, maybe he hasn’t. But he’s not going to let a 49-year-old lefty get the best of him, or have the last word. He’s adding to a surefire Hall of Fame résumé, a first-ballot one at that. A .304/.402/.533 career line, 35th all-time in Wins Above Replacement among position players, one MVP award, and six top-10 finishes, yet he still lacks the fame and acclaim showered on contemporaries like Derek Jeter, despite Chipper’s superior numbers. There’s sadness as he counts down the final games of his career, but also acceptance, even optimism. 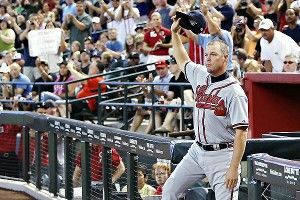 Chipper grabs a fresh Braves hat. As he pulls the navy blue brim over his brow, memories of the Chipper Jones who ran roughshod over the league for more than a decade come flooding back. If the Braves falter, he’s got just 20 weeks left in his major league career. The signature “A” on his cap staring back at you, it looks more like 20 more years.